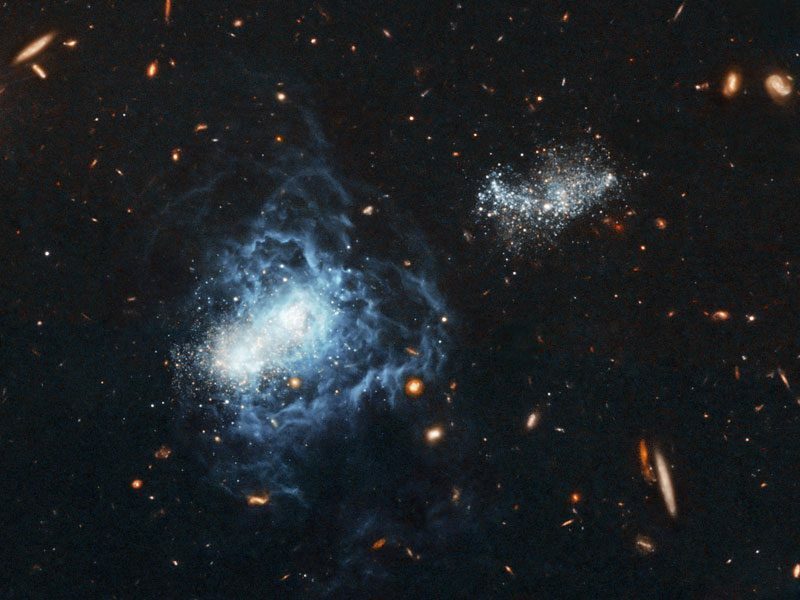 What you see is the galaxy I Zwicky 18 located 60 million light years from our beloved solar system. A distance a little large because it is not in the so-called “local group” (remember that I speak, starting from small to largest, the local group of galaxies, where ours is) which is an average of 13 million Of light years. The I Zwicky 18 is a small galaxy, mainly because it is a very young galaxy. Proof of this are gas clouds (blue in the picture) rich in hydrogen. Despite being 11 billion years old, it is a galaxy still forming, because of the gas that I told you before, which tells us that it can be for two reasons. Or gravitational (which has been attracting hydrogen and helium floating around) or by explosions of early supernovae, which has resulted in light materials. Be that as it may, the I Zwicky 18 is called (or termed) dark galaxy because it has very few stars and, therefore, emits little light. The little emitted is reflected by clouds of gas. They are usually the galaxies that should have existed at the beginning of our universe. That is why in the beginning it was considered a young galaxy (500 million years old) observing after, by which it had around, that its age did not correspond to the expected one by its development. All thanks to Hubble, with its great resolution, allowed to observe “old” stars that, because of the glow in the gas, had not been seen before. By cataloging these stars, they observed their “new” age, according to the environment. These stars (which had not been seen before) are stars type III or stars with few metals but that, commonly, they usually eject their crown by lack of gravity, mainly composed of helium and hydrogen … just what the clouds of extensive of said Galaxy have. The strange name of this galaxy is due to its discoverer, in the 30’s, Fritz Zwicky. What a curious and beautiful galaxy.